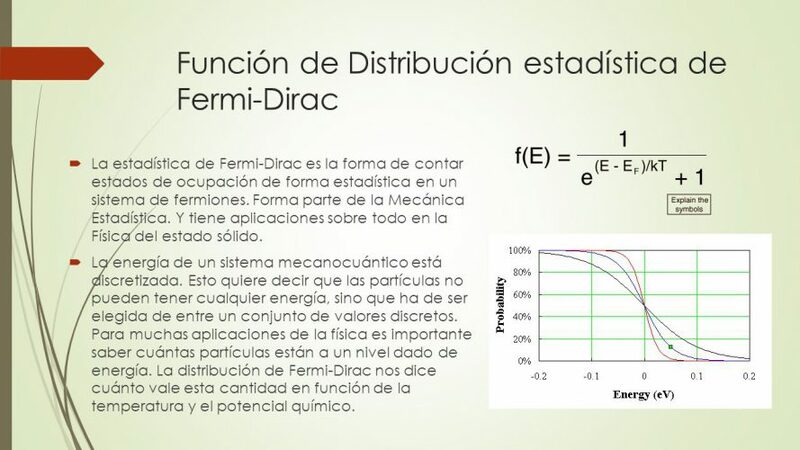 If you remember (especially me, because I start to doubt that I have spoken or not) tell you about statistical mechanics and today I want to talk about an important part of her that is the statistics mechanics of Fermi Dirac. If statistical mechanics versa “which can be” as the wave function, the atom, this fell short, or rather, you saw that if the atom meets those characteristics elements of an atom should meet the same. For that reason, Enrico Fermi and his friend, Dirac thought and developed statistical mechanics but with the favorite item Fermi fermions. As you recall a fermion particle is a basic brick of all things, whether leading or take mass force. As particle, vibrates and moves to form the elements (protons, neutrons, electrons …), so, why not going to put on in statistical mechanics ?. Dirac, which was mainly devised the formula for the distribution of the particles according to their energy (c’mon, the wave equation) revealing a powerful output called “chemical potential”. The chemical potential unites thermodynamics to chemistry and resulted in the friend Gibbs thought the energy needed for elements exchange electrons and therefore join or not resulting in the greatest confusion of history that I have mentioned, poor definition of entropy. You know, that of “order”. Virtually chemistry and biochemistry is based on this principle because without had not been explained in detail how the elements come together (or not). That is, it is their base.Si remember (especially me, and I begin to doubt that I have spoken or not) tell you about statistical mechanics and today I want to talk about an important part of her that is the statistical mechanics Fermi Dirac. For that reason, Enrico Fermi and Dirac friend thought and developed statistical mechanics but with the favorite item Fermi fermions. Virtually chemistry and biochemistry is based on this principle because without had not been explained in detail how the elements come together (or not). That is, it is their base.